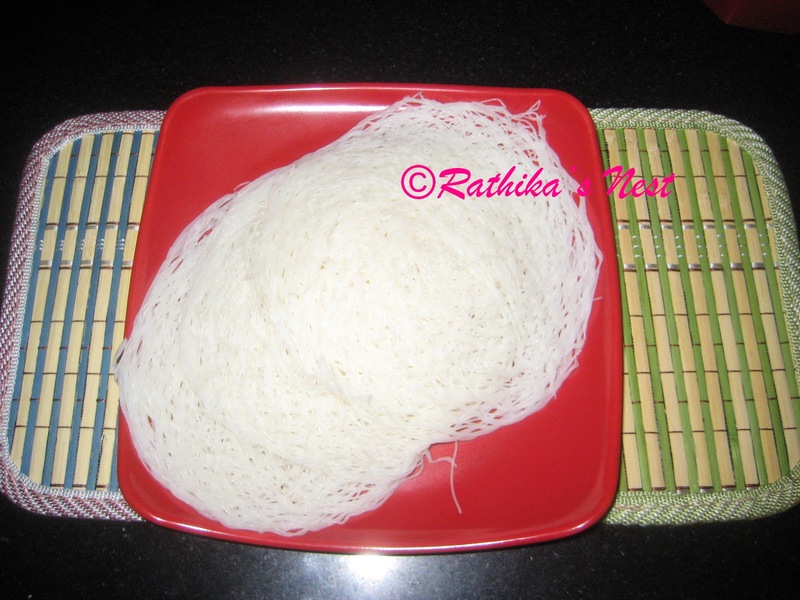 Idiâppam or string hoppers (இடியாப்பம்) is the traditional home-made rice noodles that is popular in Tamil nadu, Kerala, some parts of Karnataka and Sri Lanka. Tamil researchers note that idiâppam was part of ancient Tamil cuisine. 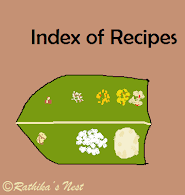 Traditionally, idiâppam is made with rice flour paste using an idiâppam maker (சேவை நாழி ) or a kichen press (தேன்குழல் அச்சு). In Brahmin cuisine idiâppam is called ‘sevai’ (சேவை), which is made with thickly ground rice batter. As the traditional sevai preparation is rather elaborate, I prefer to use the easy recipe I leant many years ago. Please give it a try. Kitchen Press: Traditional kitchen press (தேன்குழல் அச்சு) has two parts. The outer part is hollow with a detachable bottom holding the sieve, which can be changed. The outer part holds the flour paste and inner solid part is used to press the paste or dough through the sieve. Idiâppam is made with the sieve with many small round holes. Idiâppam flour: Traditionally raw rice is washed several times in water and let to dry in the shade. When half dry, it is powdered in a wet flour mill. In country side, there are separate flour mills for grinding half dry cereals. As this is not always feasible, I prefer to use regular rice flour. You may also use ‘idiâppam flour’ available in the market. Method: Idiâppam stand is used for steaming idiâppam. Remove the plates of the stand and smear them with oil. Click here to know more about idiâppam stand. Fix the sieve with small holes at the bottom of kitchen press and keep it ready. Heat water in a kadai or large vessel, add salt and sesame oil. Once the water boils, switch off the fire. Add the flour and mix well with a flat spoon into smooth dough. Divide the dough into four balls. Insert a ball in the outer part of kitchen press and using the inner part press the dough through the sieve holding the handles with your hands on either side, as given in the picture (Fig.1). Please note that dough should pass easily through the press. If not, add some more water to the dough and mix well before making idiâppam. As you press, move your hands in circular motion so that idiâppam is spread widely all over the plate. Once the dough is pressed out, repeat the process with the remaining idiâppam dough and fill the plates of the idiâppam stand. Arrange the plates on the stand (Fig.2) and steam the idiâppam in a pressure cooker for 7 minutes. Switch off the fire. Remove the stand. Let it cool for a minute. Now the idiâppam can be easily removed with tongs. Serve hot with vegetable stew or coconut milk. Note: DO NOT place the weight on the cooker while steaming idiâppam. You can easily press the dough through the sieve, when it is still hot. Click here for 'Vegetable Stew' recipe.